Hi Friends! Hope you are doing well. The calculator above is a manifestation of Rankine to Kelvin Converter. Simply, put any value of temperature in Rankine scale on the space given above, that will swiftly convert it to Kelvin scale in one go. No hassle or fluff is involved. Converting these scales is now just one click away. Rankine and Kelvin’s scales need to be converted every now and then based on the technical needs of the research project. Converting one scale to another doesn’t write off any temperature scale but helps you foresee the temperature with more than one options. If you aim to convert any temperature value from one scale to another, you must know the formula converting that values. Following formula is used to convert Rankine scale to Kelvin scale. The Kelvin temperature is equal to the temperature in Rankine times 5/9. Convert 50 R temperature into Kelvin. 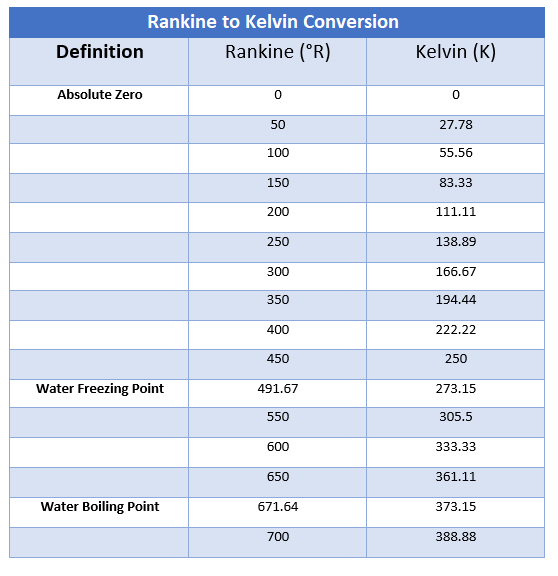 Following table shows the common values used in Rankine to Kelvin Converter. Rankine temperature is defined as the absolute scale of thermodynamic temperature. It is denoted by ºR and is named after William John Macquorn Rankine who introduced it in 1859. Heat computations in the engineering systems widely use this scale for the temperature measurements. Both Rankine and Kelvin scale share a common value at Absolute zero i.e. 0 K or 0 R. However, these don’t increment with the regular intervals until freezing and boiling points of water as water freezes at 273.15 K or 491.67 ºR and boils at 373.15 K or 671.64 ºR. Kelvin is also a thermodynamic temperature scale that is mainly based on Absolute Zero – the temperature at which all thermal motion seize to flow. It is denoted by K and is not written in terms of degree sign, unlike the other three scales that are widely written with a degree sign. The Kelvin scale is named after physicist Baron Kelvin who mainly proposed the need of “absolute thermodynamic scale. The Kelvin scale was written with degree sign before 1968, that made people skeptical where there termed it as a Rankine scale. The degree sign was removed in order to layout the candid different between both Rankine and Kelvin scale. That’s all for today. I hope you have found this post informative. If you are unsure or have any question, you can drop me a comment below. I’ll try best to help you in any way I can according to the best of my expertise. Feel free to keep us updated with your valuable feedback and suggestions, they help us provide you quality work as per your needs and demands so you keep coming back for what we have to offer. Thanks for reading the article.